How to wear fashion trends can be confusing. What is too trendy? Am I too old for this trend? Does this trend fit my body type? How in the world can I work this trend into my wardrobe? While we don’t need to fall for every trend, there is value in participating in fashion trends. If you wear a trend in an age appropriate way, it shows that you’re “up to date” on what’s happening in popular culture. This can translate into how you’re perceived. 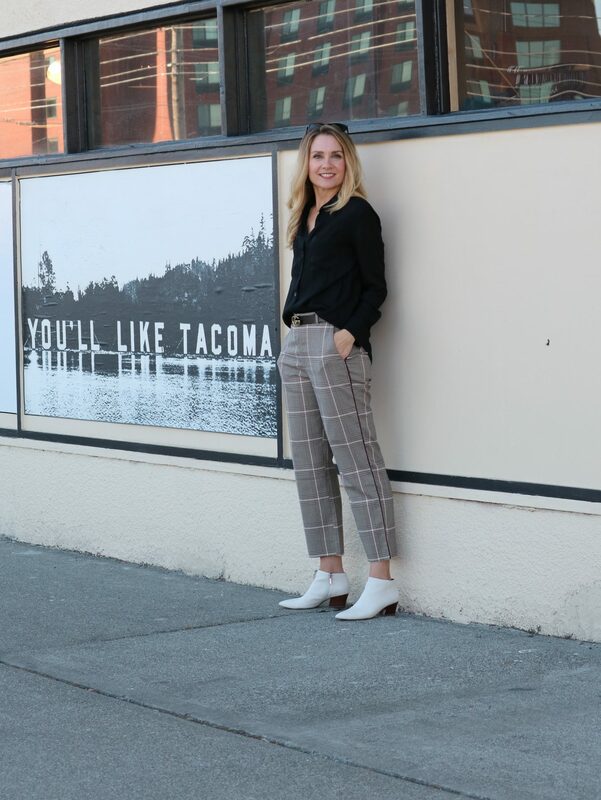 Being stylish and slightly trendy can give the impression that you’re aware of new ideas and current trends in other areas of life – whether you’re in a creative field, in business, or just trying to relate to a younger generation. Are you noticing a trend? 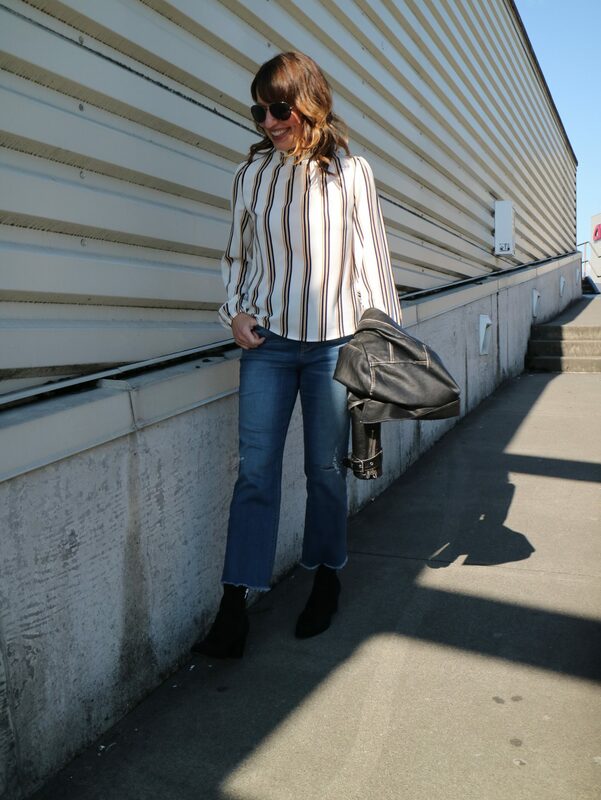 Stripes are big for fall! We both live in the suburbs, and we dress in mostly casual clothes. We definitely want to be stylish and participate in some seasonal trends, but we don’t want to look silly or like we’re trying to look too young. It’s definitely a fine line! We want to show you how we’re interpreting some of the fall trends. Our goal is to wear these trends in a way that amps up our style without looking like we’re trying too hard or like we’re wearing a costume. Western-themed clothing and cowboy boots are really popular this fall. 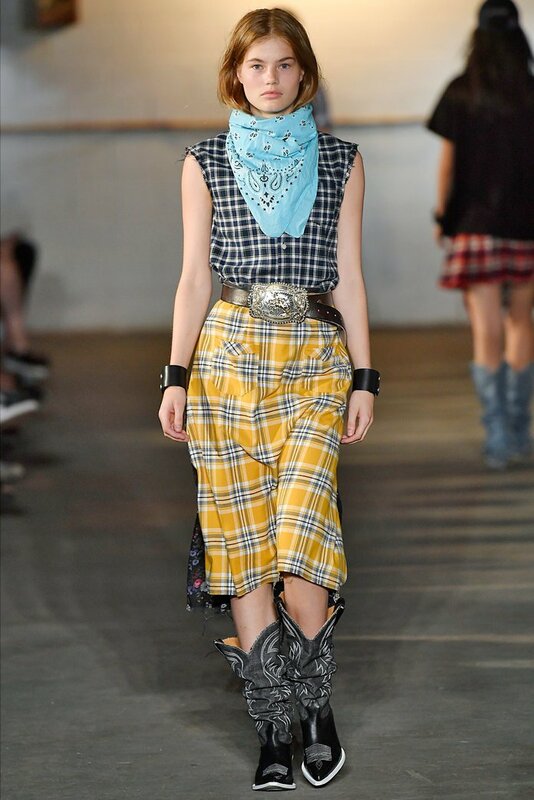 How can we wear this trend without looking like we’re going to a hoe-down?? We both found boots that are Western-inspired with a wood-angled heel and pointed toe. We’ve also worked in bandanna neck scarves. The trick is to insert the Western piece of clothing or boots in with your other non-Western clothes. The pointed toe gives a nod to the western trend. Small touches give big impact–Krista’s scarf and boots give a touch of Western without being over the top. Adding a denim jacket is classic, but has a touch of western flair. Plaid clothing definitely comes in and out of style quite often. Again, we are wearing plaid in moderation. Too much plaid can look too young, or like you’re wearing a private school uniform. 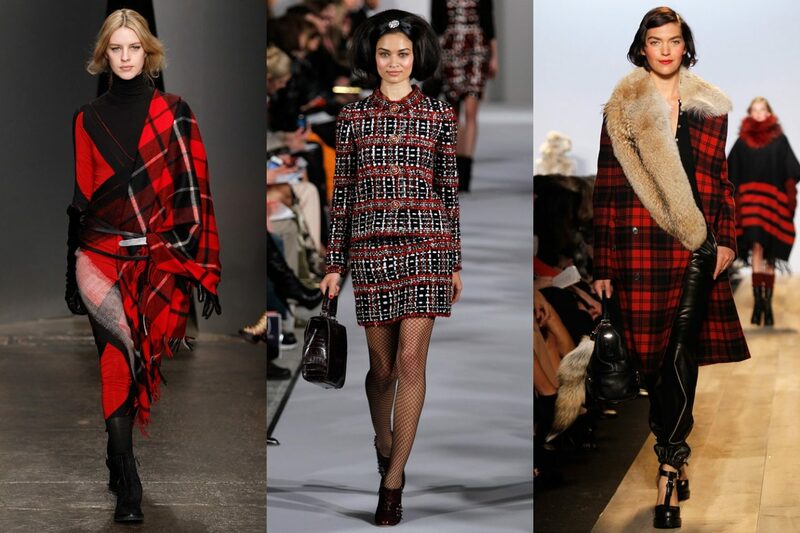 Pick plaid pieces in colors you like that coordinate well with your other clothes. Keep plaid to either a top or bottom, not both. 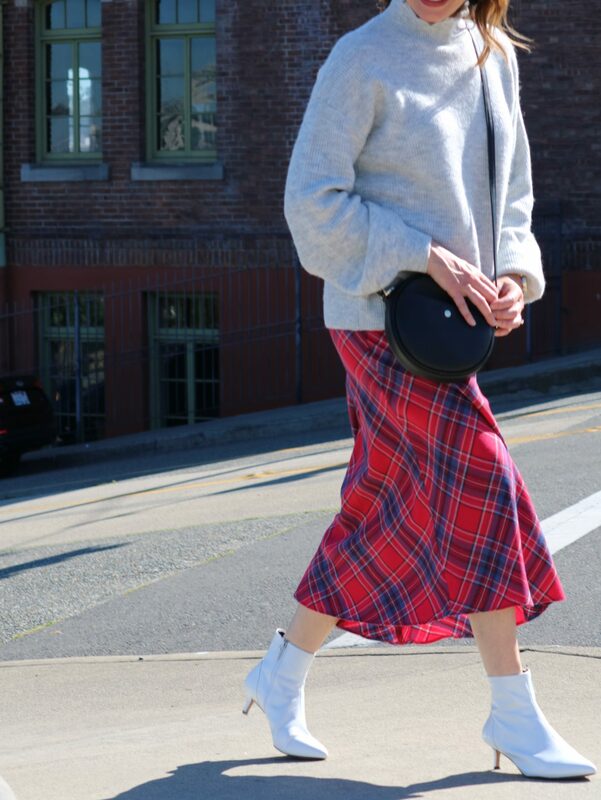 Krista is combining two big trends here–plaid and midi skirts. When wearing a busy pattern like plaid, keep the rest of your outfit plain and simple. 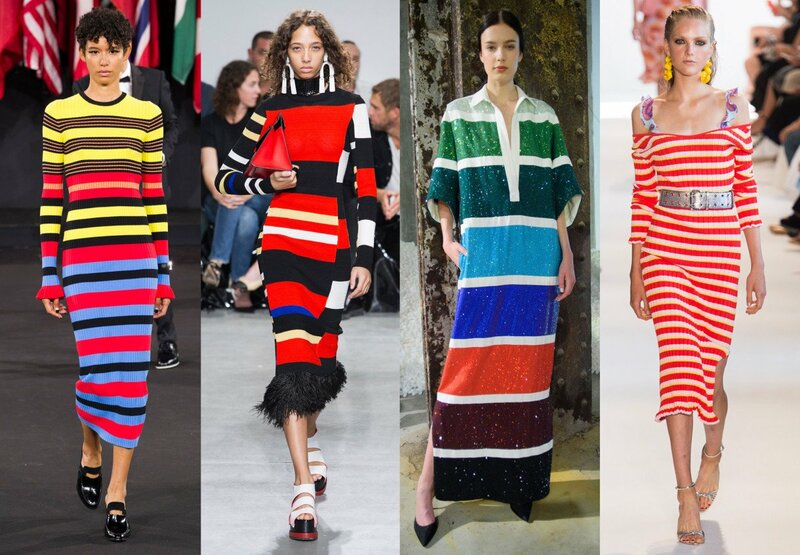 Stripes aren’t unusual in clothing, but what is different this year is how big and bold they are. Deep, rich colors are front and center and are often mixed with other colors in unexpected combinations. This is fun! After years of neutrals and pastels dominating the fashion landscape, it’s a nice departure to add in colors we haven’t worn for awhile, like red, vivid blue, and mustard yellow. The key to wearing a bold pattern is to keep the rest of your outfit toned down. We’re all for pattern-mixing, but large and bold is tricky. Stay simple with this trend to make a classy statement. Don’t be afraid of bold stripes! Paired with neutrals, it adds a fun pop to your outfit. The same goes for bold stripes as it did for plaid–to make the trend more wearable, tone down the rest of your outfit. Stripes help you bring colors into your wardrobe that you don’t usually wear! 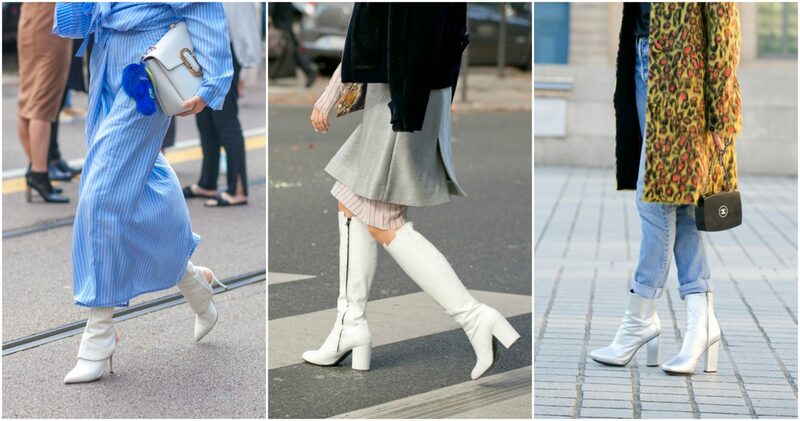 We’ve fallen in love with white boots, that’s all there is to it. They’re bold, they’re unique, and they truly elevate every outfit! We’ve made the trend wearable by keeping the heel height practical and boot shaft low. Too much in either of these categories is better left to the 20-somethings! The great thing about this trend is that it can be worn year-round! They’re perfect for casual or dressy outfits! White booties help extend the wear of your summer dresses. Wouldn’t any other shoe be so boring with this outfit? This was a great and informativd post. It can be a struggle to stay current AND age appropriate. These are great ideas for dipping your toe into these trendy waters. Thank you so much for reading. 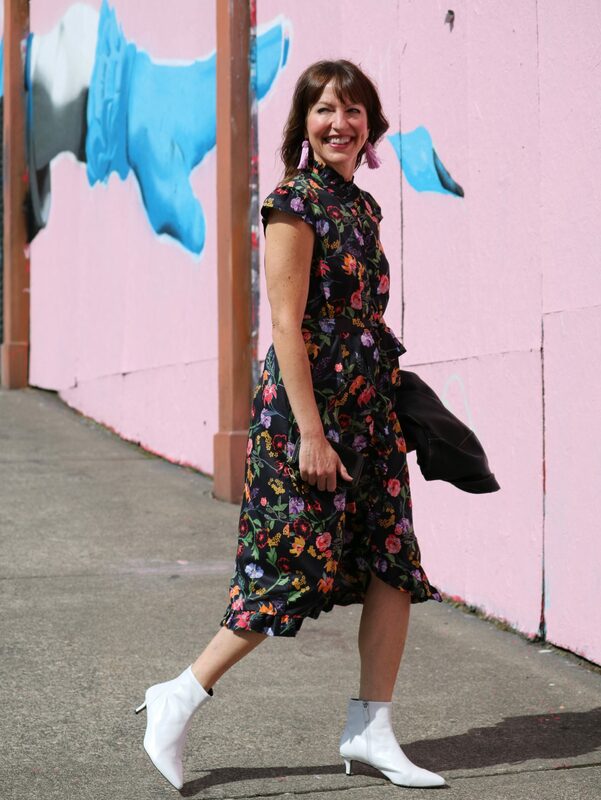 Yes, trends are for every age, but how you wear it makes all the difference! Have a great weekend!